There are so many things to do at year-end. One of them is cleaning my house. My house was built 3 years ago. The house-maker advised me to wax the floors once a year but I did them on the 1st floor only once in 3 years. I was going to do the second floor at the end of this year. I didn't have enough time to do so. In order to wax a floor, I have to make all the floor tidy. I am thinking I must do it next spring. The annual event of my family is to watch the TV program on NHK, the New Year's Eve show called Kouhaku Utagassen. It's an annual NHK sponsored year-end men versus women singing contest. I heard this program is being broadcast in many countries all over the world. Anyway I think the contest this year is not so good. It looks ugly and besides I don't like the host. My family took a long drive to my wife's original home. It's 180 miles away from Matsuyama city where I live now. When I got married 20 years ago, it took 8 or 9 hours. But now, it has been shortened to 4 hours. It's because the Seto Oohashi bridge over the Seto Inland See and Highway was constructed. My profession is to cure disease and I'm proud of my job. However, I envy the people who were related to such a big project, which would remain on the map even after their death. I sometimes imagine if I hadn't selected the medical department when I took the university entrance exam, what would I be doing now? The O.P.D. of my hospital was closed Dec. 29th at noon. The work this year was done. At lunch time all the members of my hospital got together at the cafeteria and held a Soba party. Soba is kind of a noodle made from wheat flour. Soba was used to collect gold flour in making gildings. When you make gildings, gold pigment would be scattered on your work table. Soba was used to stick and collect gold flour. We began to think that soba could collect gold and make us rich. In Japan there is a custom of eating soba at the end of the year hoping that the coming year would be a lucky year. Most members of my hospital have got off work. Only a few staff members are staying in the hospital to take care of hospitalized patients. It's so quiet in the hospital. After supper, I threw on a white coat and went on the rounds of the ward. Everything was almost complete silence except the sound of panting and life -support devices. My oldest daughter, Eri came back home. She lives in Tokyo. When she came into the house, it got noisy. My two younger daughters looked cheerful and our dog "Mocha" too. I'd been expecting she would be strong or tough because she has been living alone in Tokyo, which is unfamiliar to her. However, Eri is Eri. Nothing had changed. I felt a bit happy and a bit sad; mixed emotions. Today, I was going to get home earlier than usual because my eldest daughter was supposed to be back home all the way from Tokyo. She is a student of a university in Tokyo, the capital city of Japan. However, she sent an e-mail late in the afternoon saying that she won't get home today because she got up late and couldn't get a Skymate ticket (kind of a discount ticket for young people). I was so disappointed. No child knows how dear she is to her parents. Today is Sunday. My hospital is usually closed on Sundays but is especially open today because it's our turn. (See Every Eight Days.) Only 3 hospitals are open to the public in this city whose population is about 600,000. A middle-aged woman was transferred by ambulance. People around her thought that she might be a victim of a traffic accident. She was lying drunk on the street. I examined her and diagnosed she was just drunk. I allowed her to go home. However she wouldn't go home. That's because she was a welfare case. The Japanese medical insurance system is highly established. People who get welfare don't need to pay any medical expenses. That is to say, she can stay in hospital for free, where she can eat, sleep, take a bath, and feel relaxed in air-conditioned surroundings. The welfare system must be meant for really poor people. Most unfortunately, however, people who don't want to work utilize this system. So, of course, I rejected her desire for admittance. I live in Matsuyama city in Ehime Prefecture in Shikoku. Shikoku( means 4 countries in Japanese) is made up for 4 prefectures. Today the high school student boxing champions of the 4 prefectures gathered in Matsuyama. The Shikoku Games were held to select the representatives of Shikoku. I attended the games as a ringside surgeon. It's one of my jobs but I like to see boxing. I was lucky because I was paid for doing what I like. If someone was badly injured I would have to act as a surgeon but usually I have only to stay ringside as one of the spectators. Today is the birthday of the reigning Emperor, Akihito. It is said that the first emperor of Japan was Jinmu, who lived about 2,600 years ago. But it is uncertain whether any of the emperors from Jinmu to the 14th emperor, Chuai, actually existed, so they are treated as legendary figures. In 1868, the last Edo Shogun returned political power to the emperor, and the emperor began to rule once again. Then feudal policies such as the land-owning and class systems were abolished and a new constitution was established. In Japan there is a controversy over the allowance for the accession of Empresses. The descendants in the male line only stepped into the emperor's shoes in the past. Consequently Y-chromosome was passed down from 2600 years ago. I don't know where it's going to lead. Today the hospital end-of-the-year party was held at the Japanese-style restaurant. All the staff members except the staff on duty got together and played bingo. 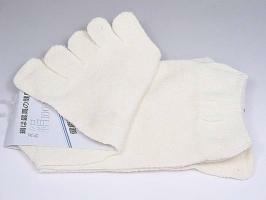 I got a pair of socks with 5 fingers. I went to see 2 female patients in their houses. Both of them are affected with sequels of cerebral apoplexy. They are confined to bed and need full-time assistance. Their husbands are taking care of their wives. I take off my hat to them. I don't know whether I could do the same as them if I were in the same situation as them. Nengajo are postcards sent as a greeting for the New Year. The Japanese send many nengajo every year. It is similar to Christmas cards in the West, though there is no religious significance in nengajo. The New Year holidays (oshougatsu) are very important to the Japanese. Nengajo are used to express gratitude, or maintain friendships on this special occasion. However if one of their relatives passed away this year, they don't send nengajo and send postcards saying "I don't send you nengajo for New Year's Day because my father, mother, , , .... passed away....and I'm (We are)in a mourning period of one year." When you receive such postcards from someone, you shouldn't send nengajo to them. Every December I receive a few postcards like that. But this December, I got 20 or more. I thought I must be getting older. Several parents of my friends, my acquaintances, and my friend have passed away this year. I send postcards expressing my sympathy in return. All at once I thought I have to be good to my parents who are healthy as of now. The strongest cold wave this winter hit Matsuyama city. 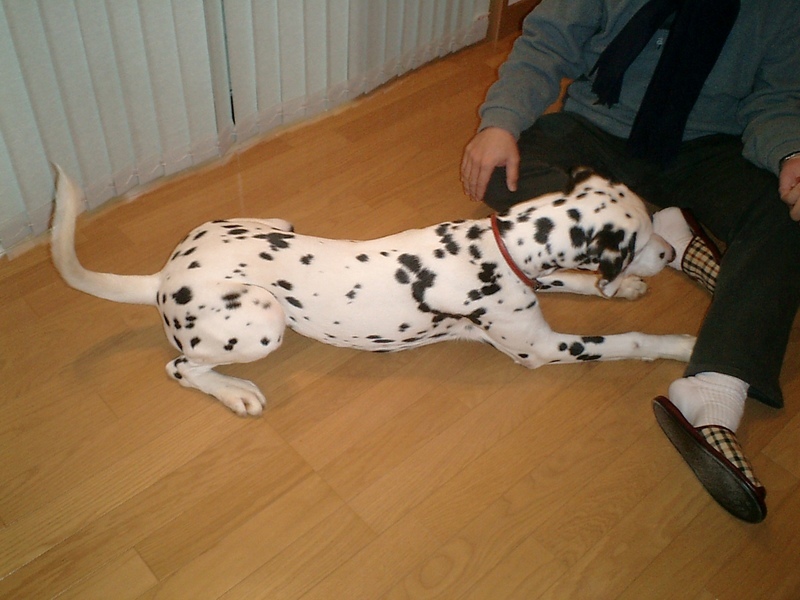 I keep a dog (eleven-month-old male Dalmatian) outside of my house. My daughter quickly sheltered him in my house by herself because I was out. She wants to be a vet and loves animals. My photo shows the hastily built shelter in the entrance. It's Friday, late afternoon. My business will be almost done. I feel like hitting the town to get a drink. When I am thinking of that, one of my buddies calls me. Let's go out! Steak? Fish? or, "Nabe" (winter cuisine served in the pot) It's a big problem. I'm teaching general medicine in a technical college of social welfare. My students are studying for a licence as a caseworker or social welfare counselor. Japan has to respond to the declining birthrate and the aging society. Many caseworkers are needed now. I'm going to register this blog to some search engines or some communities of bloggers a few month later. If you are related to medicine, welfare, and public health, send me comments or e-mails. I wish I could have many foreign friends in the same field as me. Japan is a small country, but it stretches north to south, and goes from the subpolar zone to the subtropics, so there's a wide range of climate. My home town, Matsuyama city, is located on the Seto Inland Sea and has a warm climate, but today Matsuyama was hit by a cold wave. It's so cold. I'm reluctant to walk my dog this morning. Today, I saw the movie "Princess Mononoke" (1) (2) which is a famous animated movie all over the world. While watching the movie, I had a brainwave. If foreign people see this movie, how do they feel about the Japanese culture, especially about Shinto. In the movie a wild, enormous boar often attacks some rural villages, kills people there, and damages crops. Villagers get together to capture, kill, and eat him. This kind of thing happens all the time. You don't know the half of it. After that, villagers establish his shrine, and they honor him. Why? Most foreigners will take their behaviour as honoring him, but in fact they are just sealing a boar into the shrine as a calmed being. In Japanese traditional beliefs, those who die a tragic death can become furious demons, known as onryo. For centuries, Japanese people have considered that the more powerful a living person was during their lifetime and the more tragic their death was, the more powerful and cruel a demon they could become. Such furious demons were thought to cause all sorts of disasters, including earthquakes, plagues, famines and warfare. I hope the leaders of China or Korea would see this movie and consider the Japanese culture carefully. Shrines were built to calm down their wrath and anger. Shinto priests voice holy words, compliment and honor them to prevent their horrible curse. I attended the kid's tea ceremony. 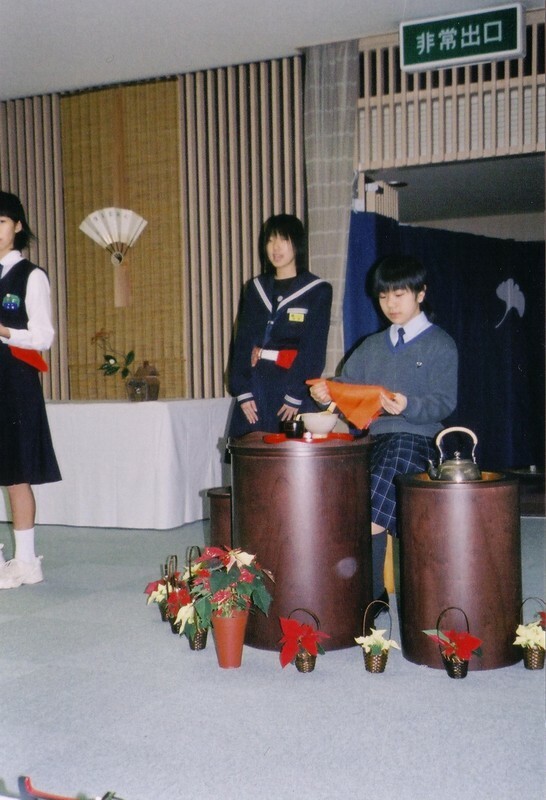 The junior high schools are encouraging students to have various experiences through school club activities. 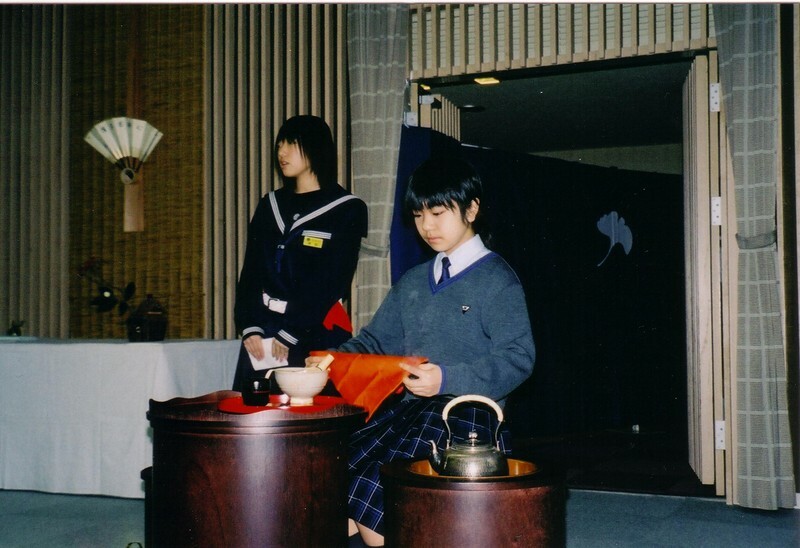 My youngest daughter belongs to the tea ceremony club of her junior high school. Today a tea ceremony party was held. The party was hosted by kids who belong to the tea ceremony club of their school or learn it privately. British people are famous for loving tea. In fact, they take their tea seriously, but they don't have to go to college for a long time. In Japan, if you want to know how to handle the tea ceremony, you have to have someone as your private teacher and you will be given a diploma. By the way, the guests were shown to their seat after paying the entry fee. They had to conduct themselves decently. Just after taking a seat, Japanese traditional candies were served to everyone by kids who behaved modestly and decently. All the kids were so polite. The tea ceremony party (Chanoyu) is a drama as well as a drink. Watching the precision of my daughter --- folding and re-folding the napkin, wiping the bowl, ladling the water and whisking the tea --- makes the hairs on the back of my neck stand up. I turned my bowl, once, twice. I drank. The tea (matcha) was bitter, but perfect after the sweets. The tea ceremony must be one of the great traditions of Japanese culture. The photo shows my youngest daughter. The photo was taken by an additional camera of my cell phone, so the image is not clear. I'd like to explain the emergency care system in my town. A certain level of hospitals are divided into eight groups. Each group is supposed to take turns to be ready for emergency cases no matter what day of the week it is. Consequently I've got to be on duty every eight days. Today is the due day for the emergency care and my hospital is open all night long tonight. I'm writing this in O.P.D. during a break in the flow of the patients. Despite it being a weekday, 2 cases of acute heavy alcoholism were transferred by ambulance. They were covered with their vomit and smelled bad, making me feel nauseous. Some people were extremely excited due to quarrelling with their buddies. Someone was being interviewed by some policemen because he had caused a serious accident by flagrantly violating the law. Many kinds of people get together here every eight days. Those people could be the subject matter of novels or inspiration for novels. Anyway, terrible black days come to me every eight days. I'm famished. Tonight's midnight meal is a rice curry. To be frank, the midnight meal is always a rice curry. This rice curry is rich in stuff, contains high calories and is delicious. Yes, hotchpotch style! It's called the "・・・・ (name of the head of my hospital) Special". It contains leftover cooking ingredients that were stocked for hospitalized patients and are close to their expiry date.